Gran Real Yucatan affords travelers with a resplendent landscape to enjoy during their stay, with the vibrant city of Merida waiting to be explored. Dating back to the 1800s, the hotel features a storied history and was once a sprawling henequen farm. Today, it features an intimate ambiance for travelers with 73 well-appointed guestrooms and suites, with colorful designs and modern amenities. With a short distance to the city's main thoroughfare, Paseo de Montejo, the city's top shopping and dining destinations are just moments away. Set within a historic district, the hotel is located nearby to a multitude of storied sights within the Yucatan region, from ancient ruins, to traditional villages, to distinguished monuments. When travelers are not exploring the myriad of destinations available to them, the hotel promises relaxation via a variety of outlets. Guests can request a luxurious massage from the hotel's in-house spa services, either within the comfort of their guestroom or poolside amid the sunshine. An eclectic restaurant serving a variety of cuisine types, from traditional Yucatecan to American buffet-style offerings, features both indoor and al fresco dining. The hotel's lounge space presents visitors with an extensive list of craft cocktails, where guests can unwind and relax before embarking on their travels once more. 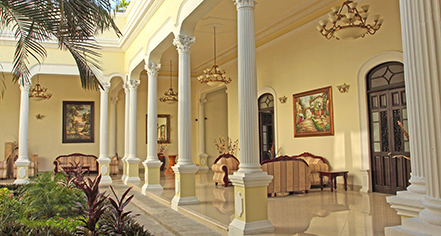 Gran Real Yucatan, a member of Historic Hotels Worldwide since 2016, dates back to the 19th century. Many of the structure's original columns and fixtures date back to the site's advent within the early 1800s as a farming export site. Cancellation Policy: Cancellations must be made on the hotel website Booking Engine subject to the Hotel Cancellation Policies and deadline periods of every season. 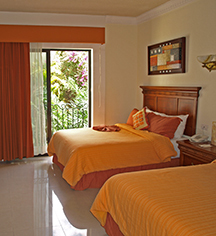 Hotel/Resort Fees & Taxes: All rates in American dollars plus tax 19 percent, including lodging. Occupancy Restrictions: Varies by room type. The largest unit available on-property can accommodate six (6) adults. Pet Policy: Service animals allowed: No. Please contact hotel. Pets allowed: No. Transportation: Car rental, may be arranged through the concierge; rates apply. Gran Real Yucatan affords travelers with a resplendent landscape to enjoy during their stay, with the vibrant city of Merida waiting to be explored. Dating back to the 1800s, the hotel features a storied history and was once a sprawling henequen farm. Learn more about the History of Gran Real Yucatan .